The smooth vanilla notes of Monkey Shoulder come from the oak barrels in which it is stored. 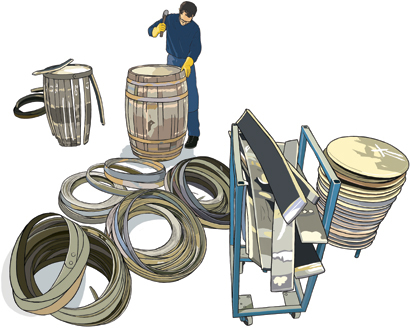 Bourbon casks are shipped over from the US and repaired on-site at William Grant's cooperage. In this illustration I've tried to capture the hot hard reality of a physically demanding and highly skilled process. Art direction by Ambition.